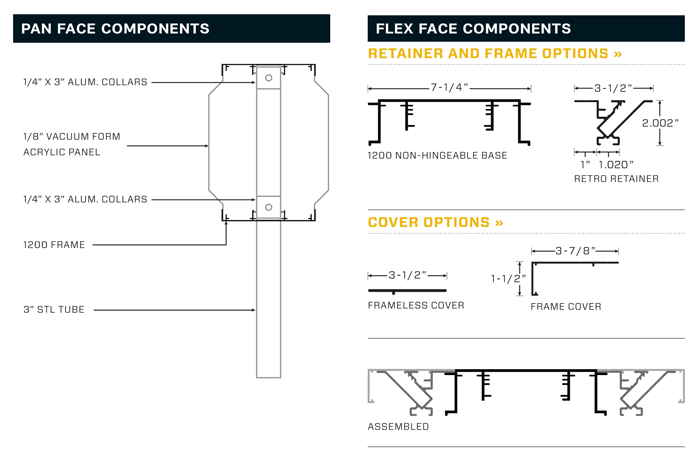 Beyond our standard panel offerings in aluminum and high impact plastic substrates, Charleston Manufacturing, LLC is now able to offer pan face configurations as well. Designed to provide a more substantial, three dimensional image Charleston Manufacturing, LLC’s pan face signs are vacuumed formed to a depth of approximately 2” so as to really stand out and provide a dramatic substrate for your graphic message. Vacuum formed pan faces from Charleston Manufacturing, LLC provide an economical option to both illuminated and non-illuminated signs. Graphic options for your pan face include second surface vinyl, back sprayed embossed lettering or first surface applications of your choice. 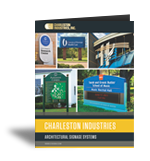 Finally Charleston Manufacturing, LLC’s pan face panels are readily adaptable into our line of architectural signage extrusions providing you with a professional look that your customer’s will simply love. Also available from Charleston Manufacturing, LLC are a complete line of flexible face panels designed to help your graphics message stand out from the crowd. Designed primarily for use with our Series 1200 framing system, Charleston Manufacturing, LLC’s flex face sign panels are the perfect choice when your project requires a highly visible and highly functional product to use in large commercial types of applications. Finally Charleston Manufacturing, LLC’s thoughtfully designed tensioning systems and choice of fabric covers combine durability with a beautiful design no matter the application. The beauty of GPP-CI architectural signage systems are their inherent versatility. Utilizing modular components, the systems can be adapted to virtually any signage application ranging from monolithic designs to interior wall-mounted directories. The GPP-CI systems offer design integrity, aesthetic quality and remarkable economy. GPP-Charleston Industries maintains a complete in-house paint facility. As a result, we are able to offer single source responsibility and a high level of quality control. In addition, our color matching capabilities are without equal. We take pride in providing full color matching services, usually in a week or less. Beyond our standard acrylic paint finish, GPP-CI can also provide anodized, Kynar 500® or other premium coatings as required. Please call us directly with your inquiries.